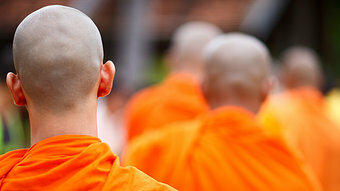 Last September, a Burmese monk stepped off a plane in Colombo, Sri Lanka, and was warmly greeted by a taller, similarly dressed Sri Lankan monk. This seemingly innocuous scene was in fact a meeting between representatives of two radically extremist Theravada monastic groups: Ashin Wirathu Thero of the 696 Movement in Burma (Myanmar) and Dilantha Withanag of the Bodhu Bala Sena (BBS) group in Sri Lanka. These groups play a leading role in the rising tide of religious extremism in their respective countries and have been active in promoting the violent ideology that has led to hundreds of deaths in Sri Lanka and what some have called “genocide” in the western Rakhine state of Myanmar.